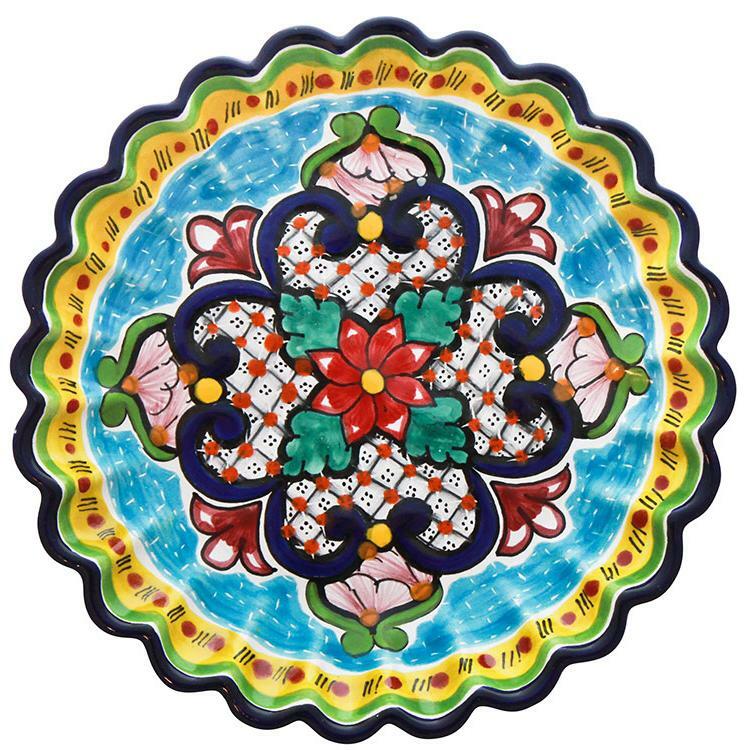 Of the tin-glazed earthenware made in colo­nial Spanish America, the variety known as Talavera Poblana is perhaps the most important. It has certainly enjoyed the longest con­tinuous tradition and is still manufactured today as it was .several centuries ago. It was also the pottery that achieved the widest distribution in America, precisely because it was one of the most important products in the trade established between colonies. Puebla’s pottery workshops were held in especially high esteem and their production included objects of everyday use, as well as orna­mental pieces of particular artistic value. During the eighteenth century some workshops in Puebla even took part in decorating certain buildings in tile which consequently gave the city’s architecture its unmistakably local color. The origin of earthenware production in Puebla has interested authors for decades. In his book entitled The Majolica of Mexico (1908), Edwin Atlee Barber upheld the popular belief that Talavera was instituted in the recently found­ed City of Puebla by monks at the Santo Domingo Monastery. It was thought these friars had sent for potters from Talavera de la Reina in Spain to circulate their techniques for producing ceramics. This theory has long been prevalent and is still reiterated, if often spiced with a dash of legend. The archival research published by Enrique Cervantes affirms that the production of earthen­ware in Puebla began in the sixteenth century. Cervantes appropriated the hypothesis advanced by Antonio Peirafiel which states that among the first citizens of Puebla were several artisans from Toledo who established the pottery industry in 1531. Completely discarding the myth that the first potters were commissioned by monks at the Santo Domingo Monastery, Cervantes concludes (without citing his sources), that there is enough information to assume that pottery began to be manufactured between 1550 and 1570; and that moreover, between 1580 and 1585, Gaspar de Encinas, a potter from Puebla, had already set up a workshop on the Calle de los Herreros. Closely examining these documents, however, we can only affirm that by 1573 the potter Alberto de Ojeda began working in Puebla and that the fol­lowing year he and Bartolame de Reina estab­lished a business partnership to make earthen­ware of all varieties, including tiles.” In 1573, another artisan from Puebla by the name of Diego Rodriguez (referring to himself as a master potter), effected a contract in Mexico City with the friar Hernando de Morales to make 1500 tiles and verduguillos (rectangular tile pieces) for the Santo Domingo Monastery. 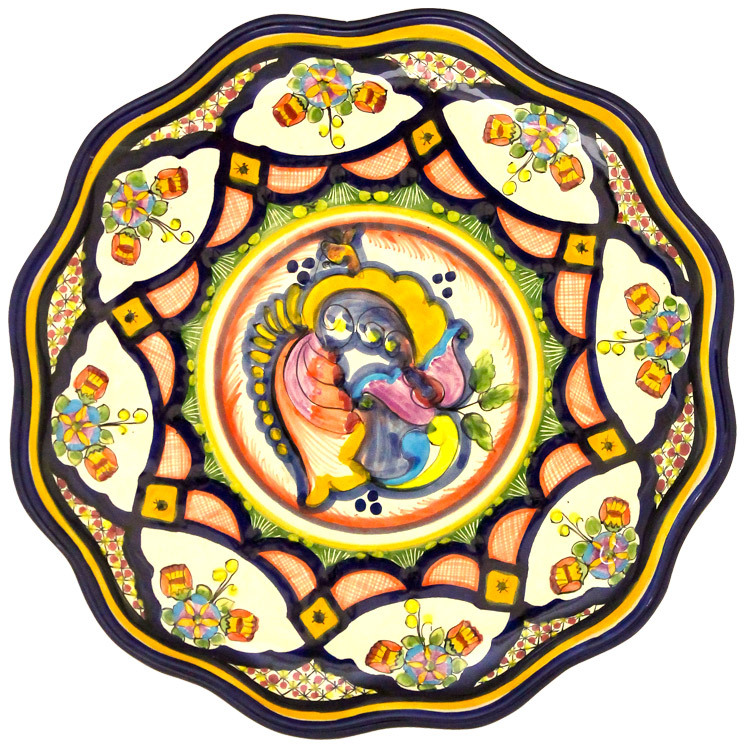 That same year Rodriguez made arrangements for ceramics-painter Domingo de los Angeles to decorate the tiles that had been bought for the monastery. Rodriguez remained in Mexico City until at least 1582 which allows us to assume that he was the first to bring earthenware and tiles to Mexico City, and later to Puebla. In 1579, “a master potter” by the name of Antonio Xinoves began working in Puebla and by the following year formed a seven-month partnership with JerOnimo Perez to do business, and profit from making earthenware.” That same year he contracted the services of someone named Juan Portuguez to help him with the work. By 1580 many other potters had begun to set­tle in Puebla where they not only found the materials needed to produce quality earthen­ware, but were also furnished with a business center which facilitated the sale of their products to various cities in New Spain. The production of earthenware became so important that by the late sixteenth century it sparked the interest of ecclesiastical authorities at the Bishopric of Tlaxcala who wanted to impose a tithe on these products. Potters were naturally opposed and eventually won the dispute by arguing that in Spain earthenware was not subject to any tithe. It is hard to determine exactly how many “white ceramic workshops” could be counted in Puebla during the first half of the seventeenth century. Though quite a number of potters and craftsmen are mentioned in archives, many of them established companies to produce pottery and tiles for varying—often very short lengths of time—which makes it difficult to specify how many workshops there were, and how long each lasted. Nonetheless, documents regarding commercial operations and services (as well as personal letters and those drawn up to contract apprentices) give us a partial idea of their activities. In the early seventeenth century, some pot­ters must have produced their earthenware with the help of only a few apprentices and craftsmen. By the end of the century, however, this began to change as the number of craftsmen gradually began to increase. These artisans were primarily Indian and in some rare cases, black or mulatto slaves. By the eighteenth century, workshops be­gan evolving into actual factories, including a master potter and artisans and apprentices under the control of an owner who wasn’t always a pot­ter himself—or herself, as was often true when ceramic workshops were run by the widowed wives of potters with the help of craftsmen and servants. The eighteenth-century chronicler Ferrindez de Echeverria y Veytia claimed that Talavera was the finest pottery produced in the City of Puebla, and wrote about ‘these workshops of white earthenware called Talavera that can be found within the city limits. 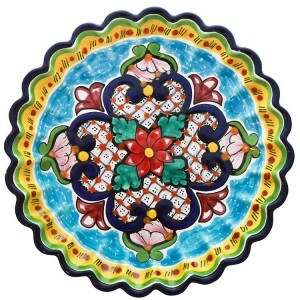 With a white clay…they make all kinds of pieces that are so polished and original, so well glazed and painted that they are just as good as any imported from Europe, which are copied perfectly. Today, tin-glazed pottery from Puebla is still referred to as Talavera, but no one seems to agree about the origin of this term. A rather obso­lete theory affirms Talavera was the surname of the first potter in Puebla to produce a ceramic piece of this kind, but this theory has yet to pro­duce any documentary evidence. Another states that it was given this name in honor of those pot­ters who came from Talavera de la Reina in Toledo to teach techniques to their counterparts in Puebla. Resorting to oral tradition, some scholars have affirmed that Dominican friars in Puebla, who were aware of a lack in local skills (and were anxious to tile their monastery) asked the Order in Tdlavera de la Reina to send friars who could teach potters the art of tin-glazed ceramics. There are no documents, however, to support this belief. 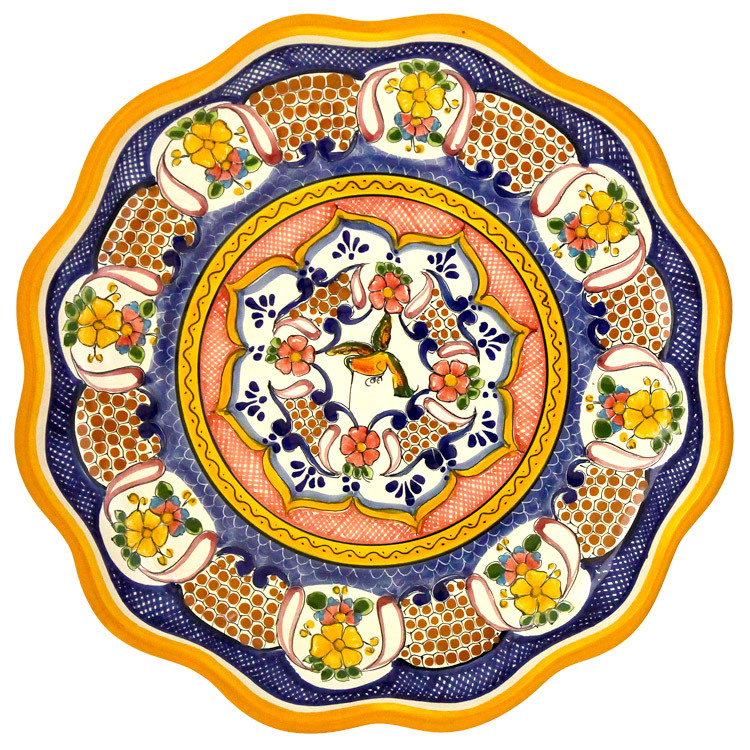 The most widely held opinion is that Talavera was given this name very simply because of its similarity to the earthenware pro­duced in Talavera de la Reina. The most recent theory is that the term was first used in 1682 when clauses were added to the Ordinances laid down by the potter’s guild in Puebla. One of these clauses stated that ‘fine pot­tery should imitate earthenware from Talave­ra…’ which is to say that the object should be so similar to the other that only with great difficulty can one tell the original apart from the counter­feit.” Other scholars claim, however, that not one of these theories or legends proves why pottery from Puebla is called Talavera. 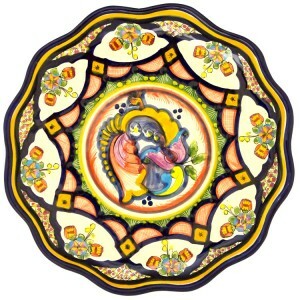 and have conse­quently insisted on the term majolica or white earthen ware. 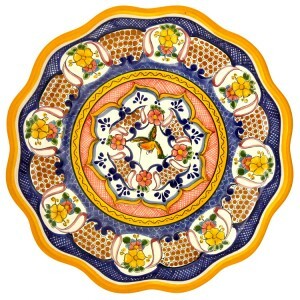 Majolica was the Italian name given to glazed porous pottery from Mallorca, which soon came to designate any similar ceramic piece. 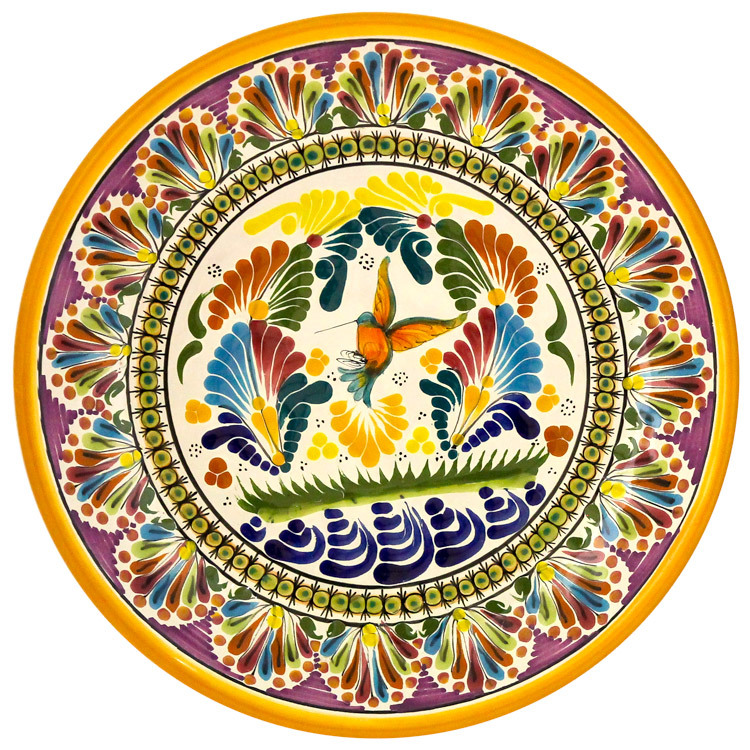 Though the term Talavera is no longer used in Spain, it is still very much alive in Mexico, especially in Puebla where potters continue to use essentially the same methods as their ances­tors. 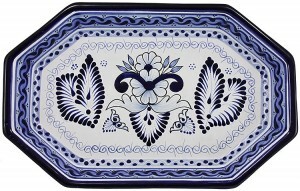 Indeed, the techniques involved in the making of Talavera have hardly changed at all since colonial times. Potters used two kinds of clay: a black variety extracted from deposits in the hills of Loreto and Guadalupe and a pink clay which was found near Totimehuacan. Once the clay’s had been sifted to get rid of all foreign matter—such as plant debris and pebbles—they were mixed and then left in water tanks “to rot”. The plasticity and quality of the clay improved the longer they were left. Before the potter could work the clay he had to remove all excess water. He then began to wedge the clay by plating it on a brick floor in a covered area where it was “treaded” barefoot to achieve an even consistency. The wedging was finished-off by hand and the clay was then divided into lumps of different sizes: the bigger ones were called tallos (reeds) and the smaller ones hulas (bullets). The potter worked the smaller lumps on the wheel to create numerous objects and used molds for making tiles. Once the pieces were completed. they were left in a closed room for a long period of time to ensure that they dried evenly. They were then fired in a wood-fueled kiln. After this firing—which lasted from ten to twelve hours each piece was examined carefully in order to separate the good pieces from those with imperfections or those that had been fired unevenly_ net-were then covered with a white glaze—made of a tin and lead base—which gave the enamel finish to each piece, According to the seventeenth-century ordinances, the proportion of glaze lo be used was 1 arroba (25 lbs.) of lead to 6 afro-bas of tin for extra-fine pieces, and 1 arroba of lead to 2 of tin for ordinary white earthenware. Once the glaze had dried, pieces were decorated with different designs. The range of choices was also designated by the Ordinances and would vary depending on the quality of the ceramic piece. Potters prepared paints from x-ariaus mineral pigments. Pieces were then ready for the last firing which would take up to forty hours. A glass pitcher, a wicker basket, a buipii of coarse cotton cloth, a wooden bowl—handsome objects not in spite of, but because of their usefulness. Their beauty is an added quality, like the scent and color of flowers. Their beauty is insep­arable from their function: they are handsome because they are useful. Handicrafts belong to a world existing before the separation of the useful and the beautiful. The industrial object tends to disappear as a form and become one with its function. Its being is its meaning, and its meaning is to be useful. It lies at the other extreme from the work of art. Craftsmanship is a mediation; its forms are not governed by the economy of function but by pleasure, which is always wasteful expenditure and has no rules. The industrial object forbids the superfluous; the work of craftsmanship delights in embellishments. Its predilection for decoration violates the principle of usefulness. 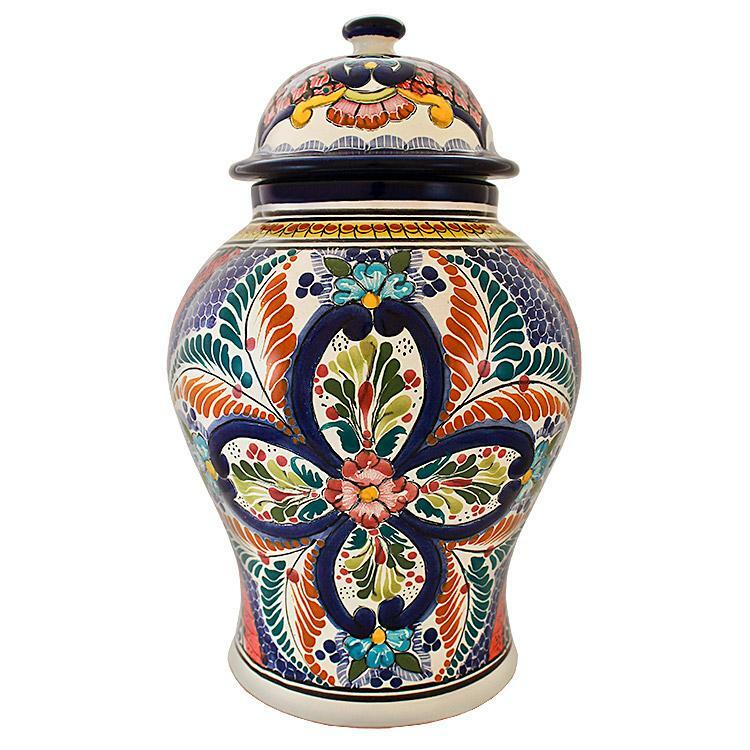 The decora­tion of the Talavera object ordinarily has no function whatsoever, so the industrial designer, obeying his implacable aesthetic, does away with it. The persistence and proliferation of ornamentation in handicrafts reveal an intermediate zone between utility and aesthetic contemplation. In craftsman­ship there is a continuous movement back and forth between usefulness and beauty; this back­and-forth motion has a name: pleasure. Things are pleasing because they are useful and beauti­ful. The copulative conjunction and defines craftsmanship, just as the disjunctive defines art and technology: utility or beauty. The handmade object satisfies a need no less imperative than hunger and thirst; the need to take delight in the things we see and touch, whatever their every­day uses. This need is not reducible to the math­ematical ideal that rules industrial design, nor is it reducible to the rigor of the religion of art. The pleasure that works of craftsmanship give us has its source in a double transgression: against the cult of utility and against the religion of art. In general, the evolution of the Talavera industrial object for daily use has followed that of artistic styles. Almost invariably, industrial design has been a derivation—sometimes a caricature, sometimes a felicitous copy—of the artistic vogue of the moment. It has lagged behind con­temporary art and has imitated styles at a time when they had already lost their initial novelty and were becoming aesthetic cliches. 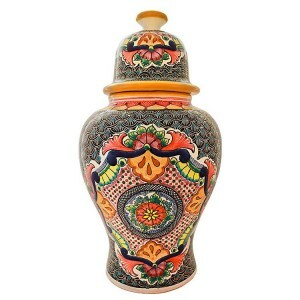 Contemporary Talavera design has endeavored in other ways—its own—to find a compromise between usefulness and aesthetics. At times it has managed to do so, but the result has been paradoxical. The aesthetic ideal of functional art is based on the principal that the usefulness of an object increases in direct proportion to the paring down of its materiality. The simplification of forms may be expressed by the following equa­tion: the minimum of presence equals the maxi­mum of efficiency. This aesthetic is borrowed from the world of mathematics: the elegance of an equation lies in the simplicity and necessity of its solution. The ideal of design is invisibility: the less visible a functional object, the more beautiful it is. A curious transposition of fairy tales and Arab legends to a world ruled by science and the notions of utility and maximum efficiency: the designer dreams of objects that, like genies, are intangible servants. This is the contrary to the work of craftsmanship, a physical presence that enters us through our senses and in which the principle of usefulness is constantly violated in • favor of tradition, imagination and even sheer caprice. The beauty of industrial design is of a conceptual order, if it expresses anything at all, it is the accuracy of a formula. It is the sign of a function. Its rationality makes it fall within an either/or dichotomy: either it is good for some­thing or it isn’t, In the second case it goes into the trash bin. 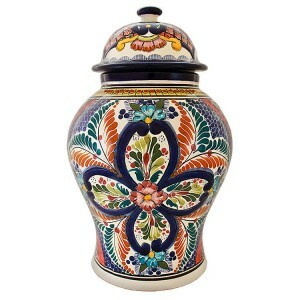 The handmade Talavera object does not charm us simply because of its usefulness. It lives in complicity with our senses, and that is why it is so hard to get rid of—it is like throwing a friend out of the house. 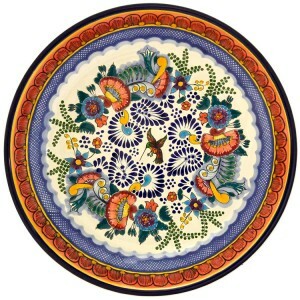 Talavera – Made by hand, the craft object bears the fin­ger prints, real or metaphorical, of the per­son who fashioned it. These fingerprints are not the equivalent of the artist’s signature, for they are not a name. Nor are they a mark or brand. They are a sign: the almost invisible scar commemorating our original brotherhood and sisterhood, made by hand, the craft object is made for hands, Not only can we see it; we can also finger it, feel it. We see the work of art but we do not touch it. The religious taboo that for­bids us to touch saints=you’ll bum your hands if you touch the Tabernacle,’ we were told as children—also applies to paintings and sculp­tures. Our relation to the industrial object is func­tional; our relation to the work of art is semi-reli­gious; our relation to the work of craftsmanship is corporeal. In reality, this last is not a relation­ship but a contact. The trans-personal nature of Talavera craftsmanship finds direct and immediate expres­sion in sensation: the body is participation. To feel is primarily to feel something or someone not ourselves. And above all, to feel with some­one. Even to feel itself, the body seeks another body we feel through others. The physical and bodily ties that bind us to others are no less pow­erful than the legal, economic and religious ties that unite us, Craftsmanship is a sign that expresses society not as work (technique) or as symbol (art, religion) but as shared physical life. The pitcher of water or wine in the middle of the table is a point of convergence, a little sun that unites everyone present. But my wife can transform that pitcher pouring forth our drink at the table into a flower vase. Personal sensibility and imagination divert the object from its ordinary function and create a break in its meaning: it is no longer a recipient to contain liquid but one in which to display a carnation. This diversion and break link the object to another realm of sensibility: imagination. This imagination is social: the carnation in the pitcher is also a metaphorical sun shared by everyone. In its perpetual move­ment back and forth between beauty and utility, pleasure and service, the work of craftsmanship teaches us lessons in sociability. At fiestas and ceremonies its radiation is still more intense and total. At fiestas the collectivity communes with itself, and this communion takes place through ritual objects that almost always are handmade objects. If fiesta is participation in primordial time—the collectivity literally shares out among its members, like sacred bread, the date being commemorated—craftsmanship is a sort of fiesta of the object: it transforms a utensil into a sign of participation. 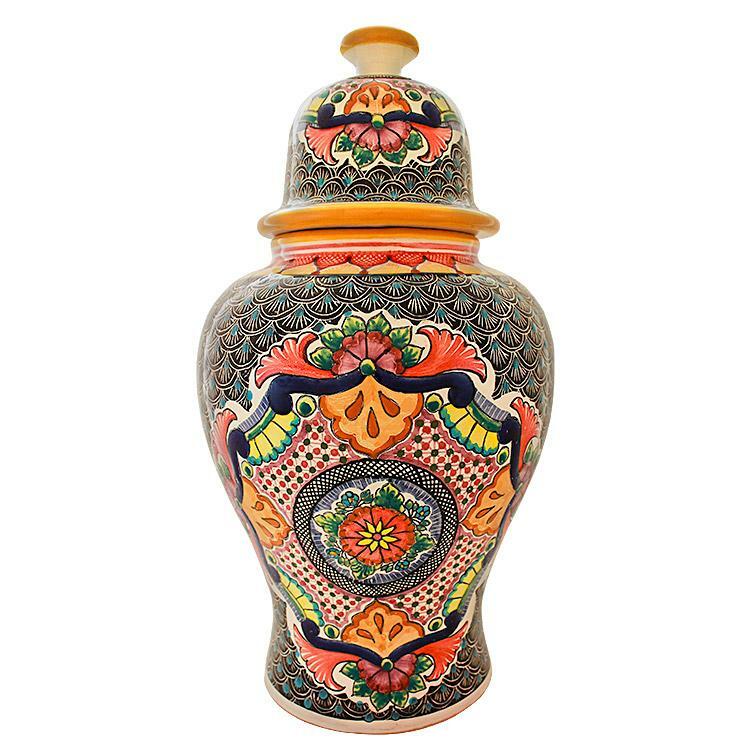 Talavera is a term shrouded in mystery, though it is no less mysterious than the human persistence in shaping glazed and painted objects from the earth: objects which clink like muffled bells when struck together and allure us with their beauty. 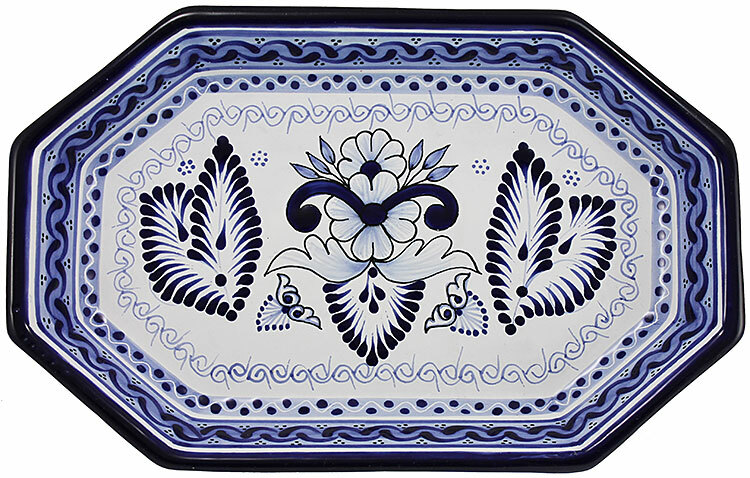 The ceramic ware known as Talavera is no doubt part of Mexico’s most important traditional art forms. 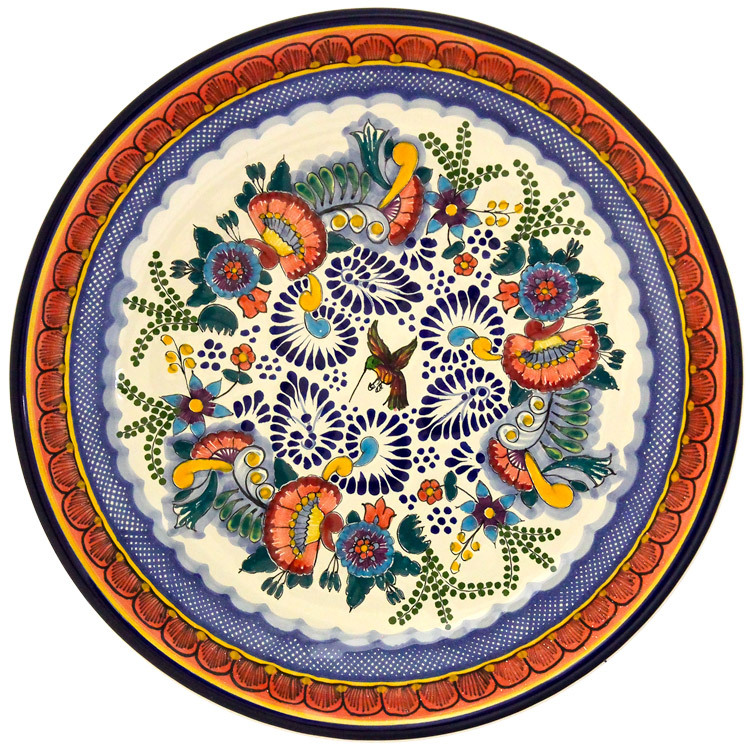 Historically, the art of Talavera is related to certain spaces: the kitchen, the church and convent, the facade and interior of the home—as well as the workshop, where the age-old rituals of the craft are still performed. Like sculpture, this art is spatial, and it also encompasses an internal space: that of the imagery represented on its surfaces. These spaces make up a world where reality and fantasy are one, where hands that make and buy and sell join with hands that paint the shape of the artisan’s. This is the world of Talavera: a world within our own world. 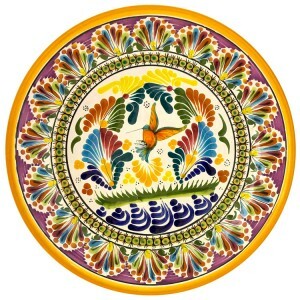 Among the first natural settings for Talavera is the typical kitchen featured in Puebla: where the tiles that cover the walls—sometimes even the ceiling—and the platters of food on their way to the table, combine to form a “culinary architecture” where the interior space of the kitchen becomes a full-scale reflection of those typical dishes from Puebla—richly flavored, colorful and unique. 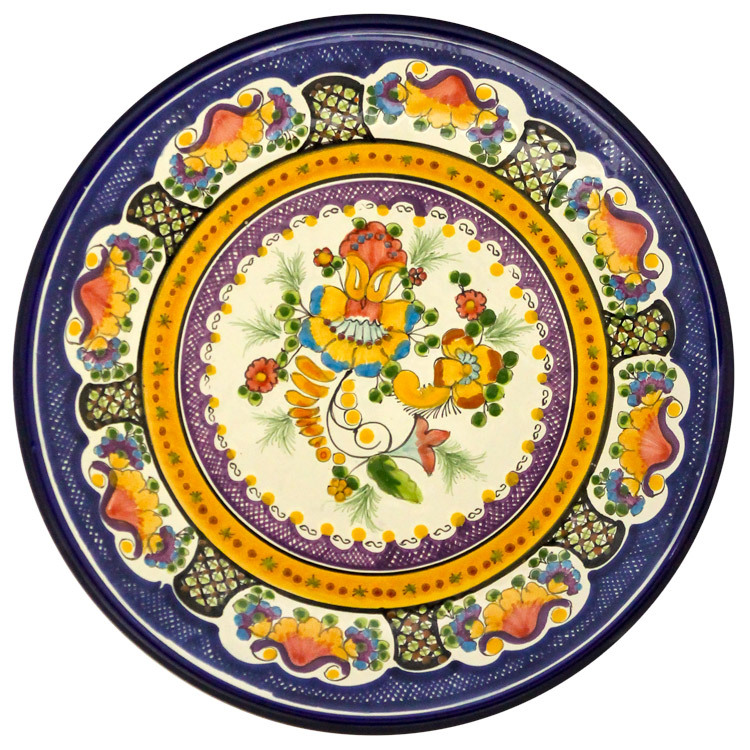 The tiled kitchen and the Talavera dinnerware made of glazed white ceramic become a sort of echo chamber where the food is enhanced by the visual condiment of Talavera. In addition to the one afforded by the meal then, Talavera offers a pleasure that enters through the eyes. And like food, it is a pleasure that is shared. A very different kind of kitchen—the traditional pharmacy—was literally lined with Talavera containers which were not only practical but often strikingly handsome. These were imperme­able on the inside and were often inscribed—before they were fired—with the name of the herb or substance they would con­tain. Or, if the jars had been commissioned to be used in the pharmacy of a particular convent, they would feature the emblem of that religious order. Churches and convents, in fact, were also natural settings for Talavera. Both housed an incredible variety of objects like the lebrillo; which was used for the both the solemn rite of baptism, as well as the banal. Day-to-day washing of hands or feet. Both the sacred and profane gestures of a community are concentra­ted in the ‘Talavera of cimrlem and convents. Though modest, this glazed curibessume pourided a sort of vivid centerpiece to the shared life of the cloister. Outside, the facades of churches were tiled with Talavera in an attempt to make the exterior syn­onymous with the wealth of gold which their altars flaunted. These facades truly project the splendor of Talavera.